Any stylish Groom will have a handkerchief as part of his Groomswear whether it be tucked into his jacket pocket or his waistcoat pocket; however all too often the hanky is part of the hire set or simply matches the tie or cravat BUT the hanky can be a statement piece on it’s own. The handkerchief doesn’t need to be a block colour to tie in with the rest of the outfit. 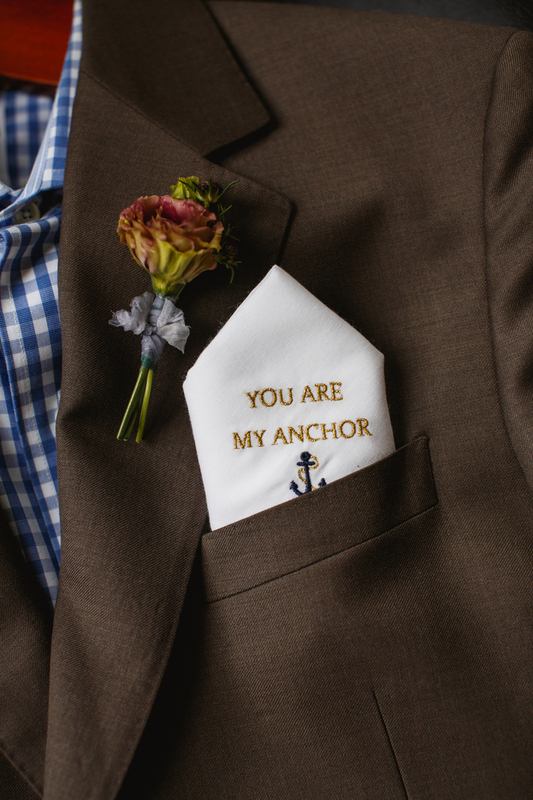 The Grooms hanky can even be different to the rest of the groomsmen’s. Think fun patterns, stripes, paisley and polka dots to bring an element of fun to the outfits and to bring a bit of personality and a bespoke feel to a suit that is likely to otherwise be “off the rack”. I’m always drawn to grooms outfits where personality is shown whether that be in quirky socks or retro braces, but the hanky is where it is at right now. The Handkerchief Shop was created in 2008 by Colleen Corcoran with two main ranges – The Happy Hanky (think one to mop up the MOTBs happy tears) and The Hank which couldn’t be more perfect for men two wear as part of their wedding suit outfits as well as to be given as wedding gifts. The Handkerchief Shop gives you the option to monogram each hanky or to have a personal message embroidered onto the hanky as the perfect keepsake. For the pocket happy price of $12 (on average, some are cheaper, some are more) you can bring new life, colour and extra style to the groomsmen’s outfits giving a feel of bespoke luxury without breaking the wedding budget. If you’re in the UK, I think the import tax would definitely be worth it, especially if you’re buying one for each member of the bridal party.